We offer a unique and fun way to celebrate any special occasion whether it be a birthday, a new baby, graduation or just simply brightening someone’s day! Inflation Celebrations will deliver one of our specialty air-blown inflatables right to that special someone’s home. The inflatable will be set up before sunrise and disappear just after sundown. Inflation Celebrations delivers a custom message from you with each inflatable. It’s that easy….reserve your date and your Inflation Celebration today! Chancy Green is a Frisco mom to three very active young girls (15, 14 and 10 years old). Her husband of 18 years lovingly supports her inflatable obsession ;). When Chancy’s first born daughter turned one, Grandpa showed up with a 6′ birthday inflatable (similar to the ones we still use today!). 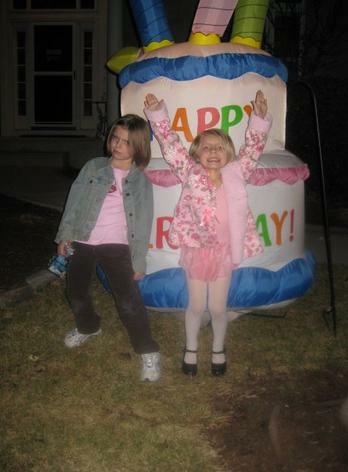 That was the start of a great tradition….Each year, she would put the birthday inflatable in the front yard to celebrate each member of our family’s special day. As their family grew, so did the number of appearances of the birthday inflatable in our front yard. Friends and neighbors would delight in seeing the inflatable go up throughout the year so that they could take part in the celebration! 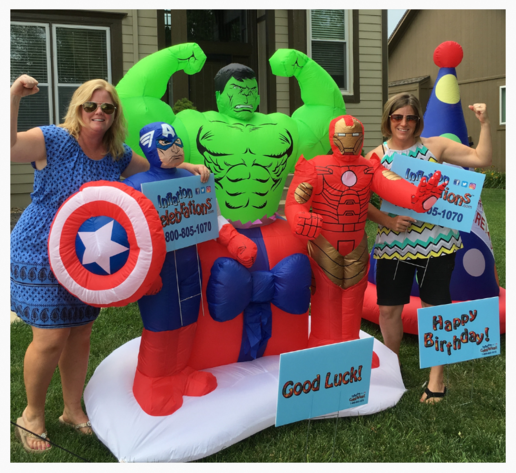 You can imagine the joy in the children’s faces upon waking up on their birthday and seeing the giant inflatable sitting in the front yard in their honor (her husband and she enjoyed the tradition on their special days as well if truth be told). As time went on, Chancy began to sneak over to neighbor’s yards in the early morning hours to surprise their kids with the birthday celebration inflatable as well. She loved seeing the excitement and the joy that could be had from this simple inflatable in the yard! It became the talk of the neighborhood and a great way to connect with others. Family pictures were taken in front of the inflatable and memories were being made….this was just too good to keep to themselves….and so Inflation Celebrations was born. A unique and fun way to celebrate life’s very special moments!